Restaurant #3: How Do You Eat An Elephant? How do you break a bad habit? How do you eat at every restaurant in your town? One street at a time. Some things in life are overwhelming. School, work, family, finances. How do you handle it? 3. Break down the situation into small parts that you can tackle one at a time. For our Cuisine Quest to eat at every restaurant in our town, I was feeling overwhelmed, until I looked at the small picture. I looked at one street. This one-mile-long stretch has strip malls, auto repair shops, a church, apartments, businesses, and 12 restaurants! There are chain restaurants: El Torrito, Starbucks, Subway, El Pollo Loco, and Yum Yum Donuts. That’s 5 restaurants we can skip. There is one catering place that is open for lunch, and one pancake house that isn’t open for dinner. That’s 2 restaurants we can skip. That leaves 5 more restaurants that we are supposed to eat at. Restaurant #1 and #2 are on this street, so we already checked them off the list. Only 3 restaurants left! That is very manageable! Restaurant #3 is a “pizza and grill”. It seems to be mostly for takeout, but they do have a nice small dining area in front of the order counter, with tablecloths and a TV to watch the game. I assumed they would basically have pizza and a few sides. But they have an extensive menu of sandwiches, pastas, salads, and sides. It was hard to choose, so we went with their recommendations. A simple salad came with the dinner. The garlic bread was also included, and perfectly tender and had good flavor. The chef recommended his cheese steak. The photo isn’t attractive, but in my husband’s expert opinion, the sandwich was tasty! Would we come back again? We have to, so we can try their pizza! But, even though the dining area was pleasant, we would probably get it to go. Two forks up! When you feel overwhelmed, how do you break a big situation into small steps? We don’t have a map or a chart or a plan yet. How will we dine at every restaurant in our town? Although I am a planner, it was dinnertime and we decided to just jump into our cuisine quest at a nearby restaurant we had never tried before. Tucked in a strip mall between a UPS store and vitamin market, this “Indian & Nepalese Food” restaurant used to be a Hawaiian shaved ice counter. So, that is what we expected, just with more curry. 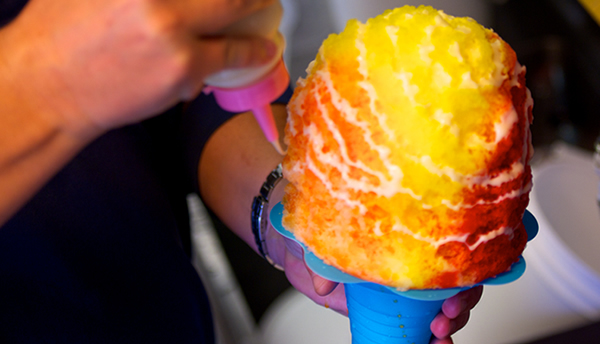 We can still get delicious Hawaiian shaved ice, but we have to drive a lot further. I did not expect this new restaurant to have a fancy interior, with intimate lighting and red and gold accents. I did not expect cloth napkins. I did not expect the place to be triple the size of the previous shaved ice restaurant. Homestyle Nepalese entrees. Classic Indian dishes. Great service. Delicious, if a bit spicy, food. Large quantities. I should have written down what these dishes are called. Chicken with vegetables in a sauce. Served with naan bread or steamed rice. Yummy! The best part, live performances! Would we return? Two forks up! Are there any restaurants in your town that have been completely transformed (for the better, or for the worse)? My husband and I are in a restaurant rut. We are trapped in a if/then feedback loop. If we want tacos, then we go to Rubios Fish Tacos. If we want salad, then we go to Souplantation. If we want a burger, then we go to Five Guys Burgers and Fries. We do have our favorite independent restaurants. But they are also part of the rut. It’s time to make a change! But how? What will keep us from falling back into old habits? We will eat once at every single restaurant in town! Our suburban city is 9 square miles of rolling hills, population 57,100. Two interstate freeway traverse the city, with one high school, one large shopping mall, many strip malls, an older revitalized downtown, 12 parks, a civic center, and an active parks and rec program. How do we find all the restaurants in our town? Our town borders other towns seamlessly, so that most residents don’t know where one city ends and the next one starts. In the old days, I would have simply looked in the restaurant section of the Yellow Pages. Every restaurant would have been listed by city. Easy! But what about now? Restaurants are businesses. So, each would have a business license on file with the city. According to our city website, I could get a list of all the restaurants with business licence for 50 cents each. So, if there are 100 restaurants, that would cost me $50. No, thank you! Google Maps has a search function. I type in my city, then click NEARBY, then Restaurants. It gives me 20 restaurants at a time, with a short description, and pins them on the map. Total number of restaurants – 141! But wait; some of those are nearby, and not in my town. I’ll have to cross check with the actual address. Very tedious. It turns out that the Yellow Pages has developed a partnership with Yelp, the online crowd-sourced reviews about local businesses. In the search boxes, I can only find restaurants near my city, not only in my city. But with Yelp, the address is in the search results, so I can easily pick out the correct restaurants. At the top right, Yelp writes “Showing 1-10 of 1458”. There cannot possibly be 1458 restaurants in my city! Or even near my city. How do we refine our restaurant list? A lot of chain restaurants are on the Google Maps and Yelp list. For our quest, we will ignore chain restaurants. But when is a restaurant a chain? Here is a good discussion about what makes a restaurant a chain. For our purposes, if there are 5 or more of the same restaurant, we will not count it. What about bars and pubs? I’m not interested in hanging out at some dingy bar that happens to serve tater tots. Not that there are any dingy bars in my town. But, just in case, we will not include anyplace that is only over 21. And coffee shops? I would not count Starbucks as a restaurant, but we have several independent coffee shops with breakfast, lunch, and dinner menus. If the coffee shop has made to order items, not just reheat the stuff in the display case, then we will count it. How do we rate the restaurants we visit? We are going to be simple here. Would we return? Forks up, or forks down. How do we keep track of the restaurants we have visited, and have yet to visit? We are map people. We are chart and list lovers. Stay tuned for details on how we corral that Yelp and Google Maps list into something manageable.